After undergoing brief medical checks, space shuttle Endeavour's crew members are taking an up-close look at the orbiter that safely delivered them back to NASA's Kennedy Space Center in Florida this evening. Guided by Commander Dominic Gorie and Pilot Gregory H. Johnson, the winged spacecraft landed at 8:39 p.m. EDT on Runway 15 at the center's Shuttle Landing Facility. The 16-day assembly mission was the longest flight to the International Space Station to date. 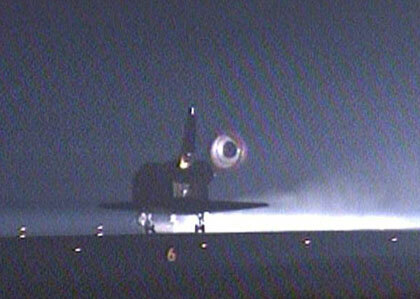 Out of the shuttle's 68 landings at Kennedy, STS-123 was the 16th to take place at night. Landing video here, here and here. Discussion here. Status Report #33 here. Check the links at right for play-by-play and NASA TV. "Welcome home Endeavour...congrats to the entire crew, to JAXA and the CSA on a very successful mission delivering the JLP and Dextre to their new home on ISS." With Commander Dominic Gorie and Pilot Gregory H. Johnson at the controls, space shuttle Endeavour glided to a picture perfect landing at Kennedy Space Center, Fla. 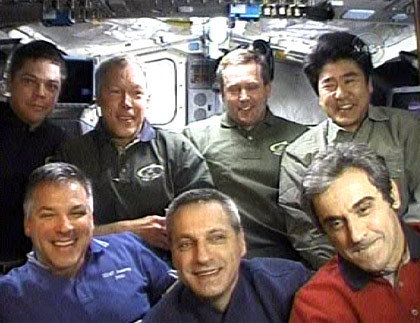 The STS-123 crew began its mission March 11 and arrived at the International Space Station March 12. 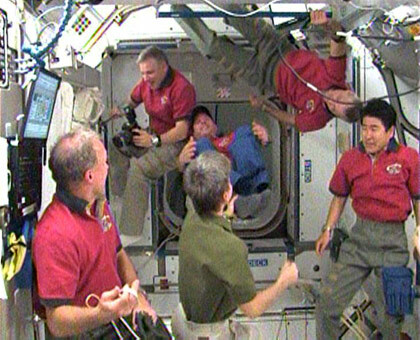 The astronauts delivered the Japanese Logistics Module - Pressurized Section (JLP), the first pressurized component of the Japan Aerospace Exploration Agency’s Kibo laboratory to the station. The crew of Endeavour also delivered the final element of the station’s Mobile Servicing System, the Canadian-built Dextre, also known as the Special Purpose Dextrous Manipulator. Mission Specialists Richard Linnehan, Robert Behnken and Mike Foreman and Expedition 16 Flight Engineer Garrett Reisman conducted five spacewalks. Three of them included tasks devoted to the assembly of Dextre and the installation of related equipment. Dextre works with the orbital outpost’s robotic arm and resembles a human upper torso stick figure. Other spacewalk activities included work to unberth the JLP, installation of spare parts and tools, installation of a materials experiment, replacement of a circuit-breaker box and demonstration of a repair procedure for tiles of the shuttle’s heat shield. The spacewalkers also stowed the Orbiter Boom Sensor System, the extension of the shuttle’s robotic arm, onto the station’s main truss during the fifth spacewalk. The Japanese pressurized module to be launched on STS-124 is too large to accommodate the boom sensor in space shuttle Discovery’s payload bay. Astronaut Garrett Reisman officially joined the Expedition 16 crew, trading places with European Space Agency astronaut Léopold Eyharts, who returned to Earth aboard Endeavour after almost 50 days in space. STS-123 is the 122nd shuttle mission and the 25th station assembly mission. The next mission, STS-124, is slated to launch in May. Landing pics and video will be at KSC. Discussion here. Check the links at right for play-by-play and NASA TV. 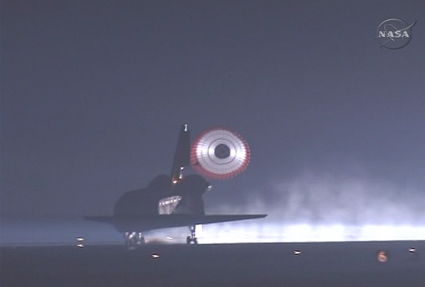 Space shuttle Endeavour and its crew of seven are officially on their way back to NASA's Kennedy Space Center in Florida after overcoming gloomy weather earlier this evening. Touchdown is set for 8:39 p.m. EDT. The orbiter fired its two orbital maneuvering system engines at 7:33 p.m., slowing the vehicle just enough to begin its descent. Farewell Ceremony video here. Check the links at right for play-by-play and NASA TV. 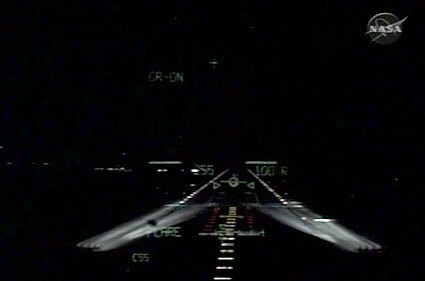 Flight controllers decided to pass on Endeavour’s first landing opportunity today. The next opportunity is at 8:39 p.m. EDT. 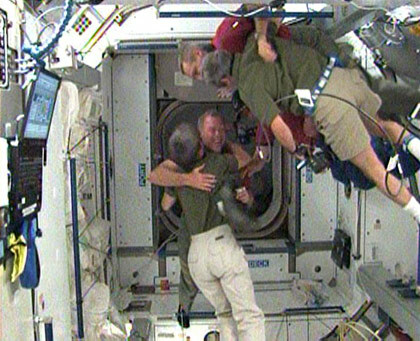 In addition the STS-123 astronauts delivered Expedition 16 Flight Engineer Garrett Reisman, who replaced Léopold Eyharts, a European Space Agency astronaut, on the station. STS-123 is the 122nd shuttle mission and 25th station assembly mission. Joint Crew News Conference video here. Discussion here. Status Report #32 here. NASA Landing Blog here. Check the links at right for play-by-play and NASA TV. The crew of space shuttle Endeavour spent Tuesday getting ready for its journey home and the end of the STS-123 mission. Early in their day, the crew members performed a test of the thrusters that will be used to position the orbiter for re-entry and the control surfaces for its flight through the atmosphere. The STS-123 astronauts also set up the recumbent seat for Mission Specialist Léopold Eyharts, who joined the crew of Endeavour on the International Space Station. The recumbent seat is a special seat designed to reduce the stress of gravity on those who have spent long periods of time in the weightless environment of space. 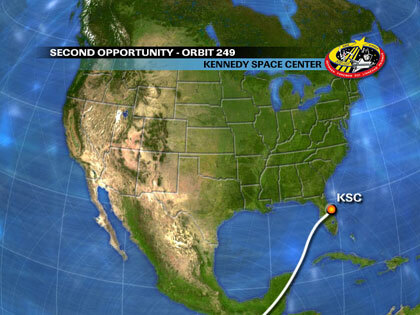 Endeavour is scheduled to land at Kennedy Space Center, Fla., at 7:05 p.m. EDT Wednesday. Flight Day 15 pics and video are up at the JSC Gallery. More launch pics and video at KSC. Discussion here. Status Report #31 here. Check the links at right for play-by-play and NASA TV. Mission Specialists Robert L. Behnken and Mike Foreman began the fifth spacewalk of STS-123 at 4:34 p.m. EDT. Rick Linnehan, also a mission specialist, is coordinating their activities from inside the orbiting complex made up of space shuttle Endeavour and the International Space Station. Behnken and Foreman are tasked with stowing the Orbiter Boom Sensor System (OBSS) on the station’s S1 Truss. With the OBSS in the grip of the station’s robot arm, the two spacewalkers will assemble an umbilical designed to keep the boom safe while it is stored in the harsh space environment. Then, the robot arm will hand the OBSS off to Behnken and Foreman, who will stow it on the truss. The next component of the Japan Aerospace Exploration Agency’s Kibo laboratory, which will be delivered on space shuttle Discovery during the STS-124 mission, is too large to accommodate the OBSS in the shuttle’s payload bay. 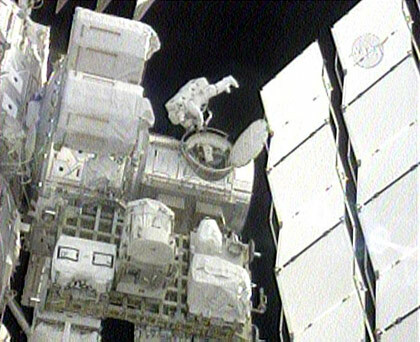 Once the next element of Kibo is installed on the station, Discovery’s astronauts will detach the OBSS left behind by space shuttle Endeavour, use it to perform tile inspections and bring it home. When the STS-123 spacewalkers have successfully attached the boom to the S1 Truss, they will release launch locks on two of the Harmony module’s common berthing mechanisms and install trunnion covers on the Japanese Logistics Module – Pressurized Section. They also will perform other tasks including an inspection of the starboard Solar Alpha Rotary Joint. In addition, the spacewalkers are tasked with installing the Materials International Space Station Experiment 6 on the outside of the European Space Agency’s Columbus laboratory, an activity the astronauts were unable to complete during the mission’s third spacewalk. With the final STS-123 spacewalk complete, flight day 14 will see the crew of Endeavour prepare for the end of their visit to the station. The orbiter will undock Monday and return to Earth Wednesday. Flight Day 12 videos are up at the JSC Gallery. Kibo tour video here. Discussion here. Status Report #24 here. Check the links at right for play-by-play and NASA TV. In a day highlighted by robotics activity, the Canadian-built Dextre was attached to a power and data grapple fixture located on the U.S. laboratory Destiny. The new robotic system is the final element of the International Space Station’s Mobile Servicing System. Mission Specialists Rick Linnehan and Mike Foreman finished assembling Dextre Sunday during the second spacewalk of STS-123. Canadarm2, the International Space Station’s robot arm, grabbed the pallet that secured Dextre during its journey to the orbital outpost and returned the pallet to space shuttle Endeavour’s payload bay for the trip back to Earth. The station and shuttle crews also prepared hardware to be used in a shuttle tile repair test on the next spacewalk, and they got some much needed off duty time. Foreman and Mission Specialist Robert Behnken are slated to begin the mission’s fourth spacewalk at 6:28 p.m. Thursday. The two will perform tasks that include the shuttle tile repair test and change out of a circuit breaker on the station. Flight Day 8 pics and video are up at the JSC Gallery. Booster cam launch video here. Discussion here. Status Report #18 here. Check the links at right for play-by-play and NASA TV. The crews of space shuttle Endeavour and the International Space Station have completed their first day as an orbital team, beginning 12 days of joint operations. About an hour before docking, which occurred at 11:49 p.m. EDT Wednesday, STS-123 Commander Dominic Gorie guided the shuttle through a back-flip maneuver, giving the Expedition 16 crew the opportunity to take pictures of the orbiter’s protective heat-resistant tiles. These photos were sent to engineers on Earth for analysis. 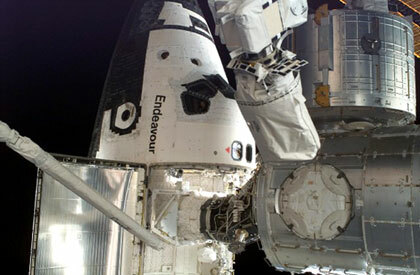 The STS-123 and Expedition 16 crews opened the hatches between Endeavour and the station at 1:36 a.m. The crews then spent time preparing for the first of five scheduled STS-123 spacewalks, which Mission Specialist Rick Linnehan and Expedition 16 Flight Engineer Garrett Reisman will begin at 9:23 p.m. Thursday. Shortly after Endeavour’s arrival at the station, Reisman traded places with Flight Engineer Léopold Eyharts, a European Space Agency astronaut, to join the Expedition 16 crew. Eyharts will return to Earth aboard Endeavour. In addition, the STS-123 crew will install the Canadian-built Dextre – the final element of the station’s Mobile Servicing System – and the Japanese Logistics Module - Pressurized Section, which is the first component of the Japan Aerospace Exploration Agency’s Kibo laboratory. Preflight video clip here. Discussion here. Status Report #5 here. Check the links at right for play-by-play and NASA TV.